These days, just about everyone has their own blog. With an estimated 2 million blog posts being posted online every single day (I know, crazy right!? ), knowing the secrets of creating a killer blog post is more important than ever if you truly want your blog to be successful. It doesn’t matter what industry you’re blogging within or how niche your blog is, you can almost guarantee that you have competitors. 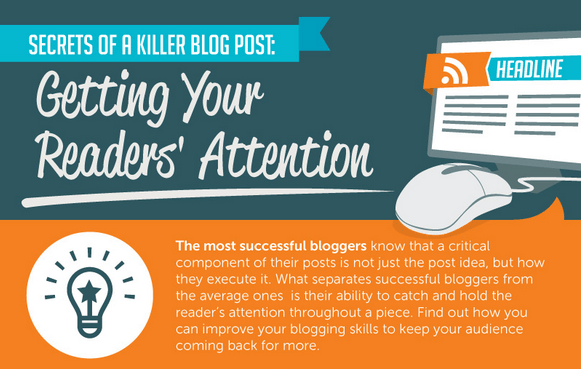 As you battle for attention with other bloggers, you need to know how to truly get your readers’ attention. Our friends at WhoIsHostingThis.com have just produced this fantastic infographic (below) which unveils some of the secrets of creating a killer blog post. It’s all about grabbing the reader’s attention. The first point the infographic addresses is the art of creating a great title. A lot of bloggers completely overlook this aspect of their blog post and it’s easy to see why. I mean, it’s the content that really matters, right? While this may be true, there’s one important point that you need to remember: If your title doesn’t capture the attention of your readers, it’s unlikely that they’re even going to click through and read your blog post at all. This renders the countless hours you’ve spent crafting the perfect blog post as completely pointless. If you look at a lot of the titles on Convince & Convert, you’ll notice that we utilize these “tricks” ourselves. Don’t forget that if you’re making promises in your blog post title, you need to follow through with that promise in the post. Empty promises will not create a loyal following and you’ll likely gain an untrustworthy reputation. Make sure your readers know just how much they’re going to benefit from reading your blog post, and deliver those benefits clearly. Write with personality. No one likes a boring or robotic blog post, let your personality drive the post! Include interesting/shocking statistics and facts. Make sure you double check authenticity when using data in your posts. Ask your readers questions throughout the post. This makes them feel more engaged and keeps them searching for answers. Offer value. This is the most important tip. Every blog post MUST offer value, otherwise your readers have no reason to ever come back to your blog to read your content.